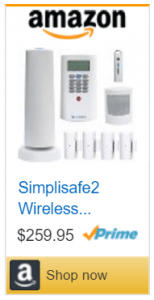 If you are trying to decide on the Best DIY Alarm System – this SimpliSafe vs. Protect America Security System Review compares two of the most popular DIY Home Security Systems available. They are both among the top rated security systems and each of them will serve you well in protecting your home and family. However, they have distinctly different approaches to providing that protection, and we hope this comparison will help you sort out the differences and help you decide which alarm company works best for you. In this side by side comparison review, we are contrasting Simplisafe and Protect America in 5 distinct categories. For the purposes of this review, we weigh each of the categories evenly. To facilitate navigation, you can click on any of the links in the Table of Contents to the left to jump directly to specific areas of interest. We will choose a “winner” at the end based on the cumulative number of “rounds” won. However, YOUR selection may vary based on the the priorities you assign to any individual category. With 24 years of experience, Protect America introduced the DIY home security business model over 15 years ago…and now protects over 500,000 homes and families across the US. Based in Austin Texas, Protect America has earned an A BBB rating and has been ranked in the top 15 home security companies in the country for the last 5 years by the SDM, Security Dealer Magazine. SimpliSafe has become one of the most well known DIY home security companies over the past 10 years with a very straight forward approach. They provide a simple, yet effective DIY home security system- with no contractual requirements. Although we did find a bit of negative online feedback regarding customer service, SimpliSafe boasts an A+ BBB rating. While they both enjoy a reputation for providing quality service and have similar BBB ratings, Protect America has been around longer and maintains a customer base of over a half million. 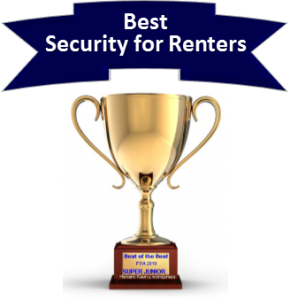 In addition to earning a Consumers Best Buy for their Copper Package for 5 years running, earning a Top 15 ranking makes them the DIY alarm company to beat. In a close round, Protect America holds a slight edge in this category. SimpliSafe offers equipment and monitoring services separately…and does not subsidize the equipment. Consequently, they they are significantly more expensive up front…but, they do not require a monitoring agreement. 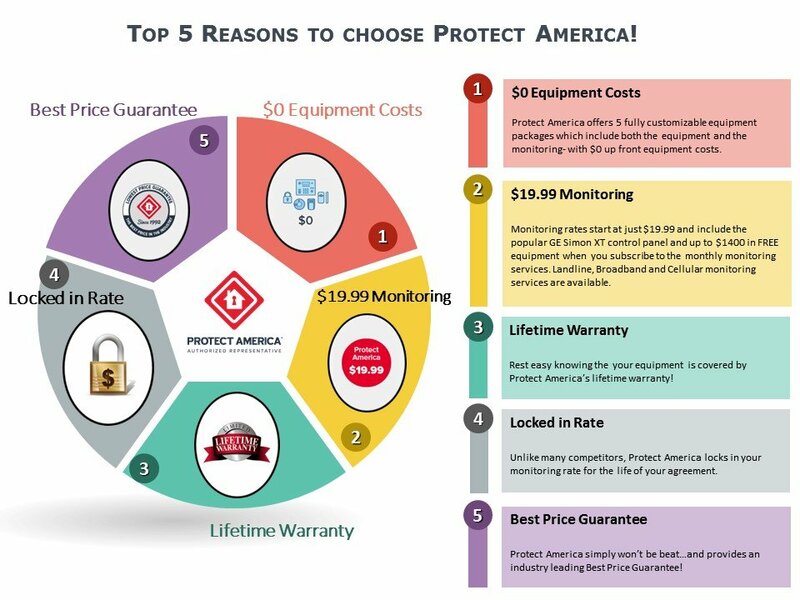 Protect America requires and industry standard 3 year monitoring agreement, but they offset that by eliminating the upfront costs and offering the most generous equipment subsidies in the industry. Both SimpliSafe and Protect America offer monitoring services by respected 3rd party providers with UL Listed, Five Diamond Certified monitoring stations . However, Protect America offers better redundancy with their Criticom monitoring which leverages a total of 3 central stations. This ensures that calls can be re-routed to another station in the event that there is a regional natural disaster where any one of the centers are located. Because customers pay for the equipment outright, Simplisafe offers monitoring starting at just $14.99…where as Protect America’s monitoring rates start at $19.99. For $24.95 one can control a SimpliSafe security system remotely with their mobile app…as well as receive notifications and alerts of alarm activities and events. Protect America includes their app free with any broadband or cellular monitoring packages provides considerably more equipment in their premium monitoring packages, as is outlined in our Protect America Security Review. SimpliSafe does not offer any home automation or video surveillance capabilities. On the other hand,Protect America offers advanced home automation and surveillance as well as some nifty advanced monitoring features such as wireless driveway alerts and vehicle tracking capabilities. These are innovative features and monitoring technologies that improve the security, use-ability and functionality of the today’s best home security systems. Conclusion – Both alarm companies offer quality UL Listed and 5 star certified monitoring services, but only Protect America offers fully redundant services. And while SimpliSafe offers a lower entry level service price, Protect America has a more robust line-up of monitoring services necessary to meet the needs and demands of a modern security and home automation system. Additionally, they include substantial amounts of equipment within their monitoring packages to make a comprehensive security system more affordable. Chalk this round up to Protect America. Both Protect America Security and SimpliSafe have a track record of exceeding customer expectations when it comes to customer service. This is reflected in strong BBB ratings. They make it easy for the customer to get support in virtually any manner they prefer with online videos, tutorials and e-books as well as e-mail and live telephone support. Protect America offers extended phone support hours to better accomodate schedules in all time zones. However, SimpliSafe offers a far superior return policy, by offering a full 60 day window as opposed to Protect America’s 14 day policy. In another close call, SimpliSafe comes out ahead with their 60 Day Return policy. Protect America uses the the familiar GE Simon XT to power their home security systems. 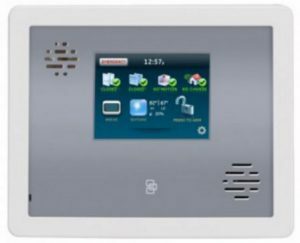 This system has a proven track record of reliable performance in the field and has been one of the most popular security systems used by many of the best home security companies for many years. or Platinum packages. With a 5″ full color touchscreen display and interchangeable face plates to match any decor, it is a very attractive alternative to the more basic system. Either system can be equipped for Landline, Broadband or Cellular based communications. 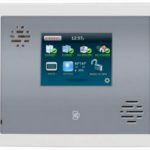 With a 40 zone capacity and Z-Wave compatibility, they are fully capable of managing the security and home automation needs of all but the most elaborate systems. And if you are looking to remotely monitor what is going on inside the home, Protect America has video surveillance capability as well. All of which can be monitored and managed through their Smart Connect mobile app. They even have driveway sensors to alert you if someone is visiting…and vehicle tracking sensors to help keep track of the whereabouts of your vehicles. It will even send you notifications if the vehicle travels outside of a pre-determined area or exceeds a certain speed. 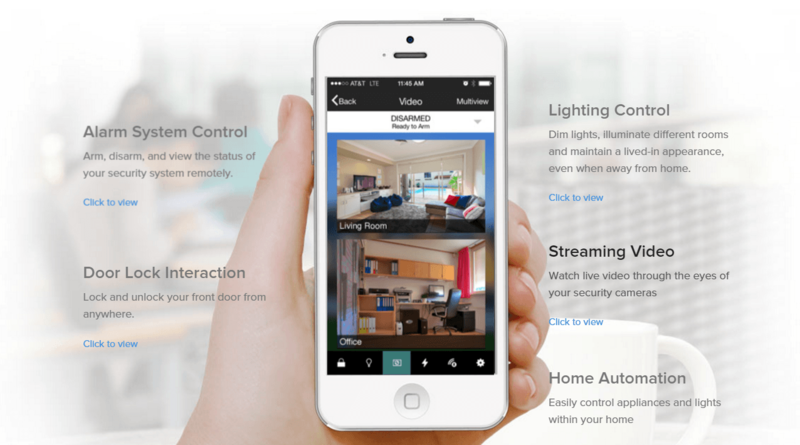 Additionally, Protect America has full home automation capabilities allowing you to control lighting, small appliances and door locks remotely as well. And everything is backed with a Lifetime Warranty! Conversely, SimpliSafe has a much more basic approach when it comes to equipment and technology. Instead of name brand equipment, they use proprietary equipment. While this may help keep the costs down, it also means that the equipment cannot be used with another company, should you wish to change providers down the line. While the Simplisafe equipment has proven reliable enough to extend a full 3 year warranty, it is often maligned for its rather clunky and outdated appearance. While the equipment would not be described as “state of the art”- it gets the job done and is simple to install and set up. SimpliSafe does not offer home automation or video surveillance equipment. When it comes to equipment and technology…Protect America offers a clear advantage. While SimpliSafe equipment is proprietary and somewhat antiquated, Protect America offers a full line-up of name brand equipment from one of the largest equipment manufacturers, Interlogix (formerly GE). It is fully compatible with virtually any company’s systems should you ever decide to switch. 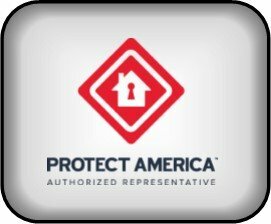 Protect America also offers some unique capabilities with driveway sensor technology and vehicle tracking. With no available video or home automation capabilities…SimpliSafe “simply” can’t compete with the superior equipment and technology offered at Protect America. While the monitoring rates are much more affordable at SimpliSafe, the up front investment for even a basic system is substantially higher. In addition, Protect America subsidizes the cost of the equipment and offers $0 up front pricing…making it the clear value leader. SimpliSafe provides their customers with a system that is easily installed, which provides basic security at a reasonable price point. If you aren’t concerned with having the latest technology or the capability for integrated home automation, they are a good choice. But…be aware that their equipment is proprietary, and is not compatible with other systems -should you decide to switch providers or want to upgrade in the future. While their monitoring rates are a bit higher, Protect America delivers more bang for the buck overall for those who want more than the most basic security system features. They provide outstanding service, reliable monitoring, and a comprehensive selection of name brand security and home automation equipment options with no out of pocket up front expenses..
For most consumers, Protect America earns a decisive victory in this side by side comparison. So which is best for me- a Protect America or SimpliSafe Home Security System? 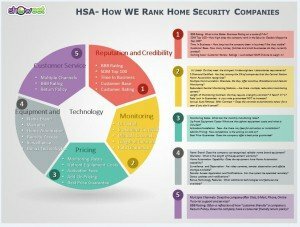 While this comparison might lead one to believe that Protect America wins by a landslide…the reality is that each of these home security programs is targeted to meet the needs of different customers. While they both are DIY security systems, Protect America is designed for those who are looking to minimize up front costs and wants more of the bells and whistles. Simplisafe appeals to the consumer market that seeks only the most basic security solutions. If you are seeking very basic home security that is easy to install, and have no interest in home automation, video monitoring or touchscreen keypads-with either no contract or the lowest possible cellular monitoring costs, look no further- SimpliSafe is for you. If you want $0 up front costs, competitive monitoring rates and access to the latest security and home automation technology–Protect America will better suit your needs. 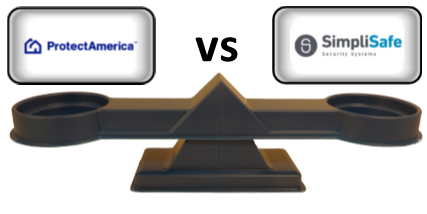 A significant differences between SimpliSafe and Protect America is who manufactures the equipment. Protect America uses GE/Interlogix -one of the best known name brands in the industry. Should you ever decide to use another service provider (after you have satisfied the original terms of the agreement)…the equipment is almost universally compatible and can easily be incorporated into almost any system that is used by most reputable home security companies. SimpliSafe equipment is proprietary. Consequently, you are pretty much stuck with the equipment and will have to purchase all new equipment is you decide you want to go with another company. Thank you for visiting. Please feel free to leave your comments and feedback on this Protect America vs. SimpliSafe Review, below. For latest Protect America promos, call the Promotional Hotline - 1.888.951.5140 .... orClick Here!